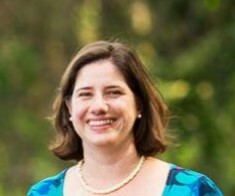 Part of the magic at Summit Montessori comes from the unusually intimate atmosphere we create. Our "small by design" size allows us to personalize each student's education and celebrate each student's individuality. Our goal is to ensure that our students receive an excellent education that prepares them for middle and high school, and ultimately for life beyond the classroom. But we are also committed to educating and nurturing the whole child, which includes compassionate attention to each student’s social and emotional growth. Summit accomplishes its work with the limited resources of a small institution through the vision and diligence of dedicated teachers, administrators, trustees, volunteers, and donors. Our extended community helps lay the foundation for a viable, solvent future and a strong educational program through its generous and regular annual giving. The Summit Fund, our School’s annual fund, closes the gap between the actual cost of an education and the tuition we receive. Every gift has an impact; every gift makes a positive difference to every student, every teacher, and every classroom. Our School would truly be a diminished place without the generosity of our parents, grandparents, trustees, faculty, staff, and friends. We are tremendously grateful for the support of our entire community as we work to shape the next generation. When we initially researched preschools for our children, we were not excited about our options. After a brief stop in a public preschool, we were soon searching again. We lived about 30 miles away from Summit at that point, so were obviously looking at schools closer to home. We went to private preschools, public preschools, religious preschools and really anything that hinted about being a preschool. All to no avail. One of our friends said, "have you tried looking at Montessori? Our son is 15 and says he wishes he was still in a Montessori school. We loved it." Monte-what? So we widened our search and ended up visiting Montessori schools in and around MetroWest. Our visit to Summit was probably much like your visit to Summit...we rang the buzzer, Louise welcomed us and asked how she might be able to assist us, escorted us to the foyer with the comfy chairs, offered us coffee or tea and said Siobhan would be with us momentarily. Siobhan met us with a huge smile and a warm and melodic "hello." You know what we're talking about. We toured this gorgeous mansion with all of the children happily working with materials we hadn't seen in the classroom before....at least not in the past 100 years. An abacus? What is going on? Where are the toys, computers and tablets? Did we just time warp? But wait....why is it so quiet in here? There are how many children in this building? What are those little white rugs? Why isn't anyone crying, "Johnny just took my train!" just like all of the other preschools we recently visited? Just as we were dizzy with confusion over how there could possibly be 80 children in one mansion without trying to talk over each other, a child came bounding down the stairs in a confident yet controlled manner. He looked at us...in the eyes....yes, he made eye contact with adults...and said "Hi. Welcome to Summit." We looked around like he surely couldn't be talking to two strangers, making eye contact and using the word "welcome." Oh, but he was. And there were many more like him who held the door open for us, came into Siobhan's office to ask if she had any recycling that needed to be taken out and were constantly SMILING. Let's fast forward to signing our enrollment contracts and bringing our children in for their first day of school in April. That's right, April. Why? Because once we saw how the Summit Montessori experience was transforming these children, we didn't want them to miss another minute of that special sauce. We had concerns that Ty, who had just turned four, and Aly, who was two, would have difficulty "fitting in" with their classes since the Summit children had all been together since September. Not at all. The Summit students, teachers and staff mentored, supported and loved them from day one. We knew we made the right choice for our children. Fabulous! 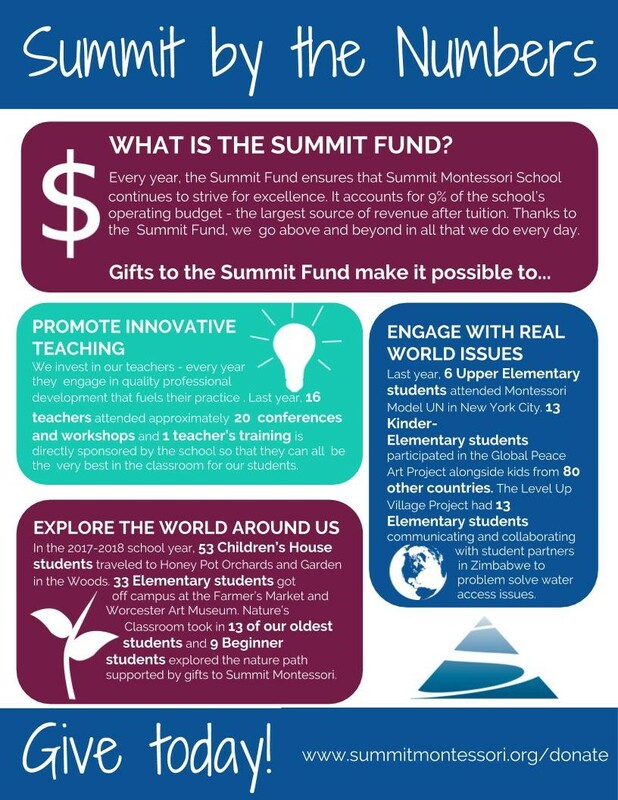 This is why we give without hesitation to the Summit Fund, our School’s annual fund. Our children are thriving, happy and thoughtful. We are consistently amazed by what they accomplish academically, socially and emotionally with the incredible team at Summit. They literally LOVE to go to school and they LOVE to learn. We are thrilled with the progress they have made in the eighteen months we have been part of the Summit community and we are excited to see what the future holds. We had no idea that our tuition did not cover the full cost of operating this wonderful Montessori school. The Summit Board of Trustees has worked very hard to strike a balance between increasing tuition to cover the costs of all of the magic that is Summit, and keeping the tuition as affordable as possible. This is where the Summit Fund comes in to support such things as enrichment assemblies, visiting artists, multiday outdoor educational excursions as well as dealing with the basics like payroll, classroom materials, and campus upkeep. The more current Summit families who contribute to the Summit Fund, the more opportunity there is for donations from folks who do not currently have children enrolled in this amazing program. 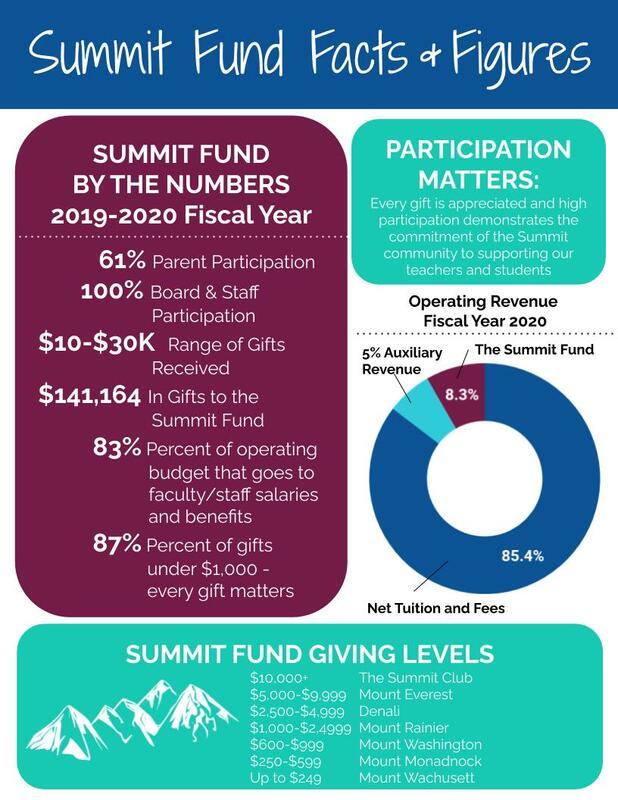 Outside donors often ask for the percentage of current families who make donations to gauge how much we, as Summit’s most important stakeholders, value what the school has to offer. We offer our sincere thanks to all of you who have given, and continue to give, to Summit. Your collective generosity supports all of the wonderful programs we have and helps move Summit to the next level of excellence.